The Oregon Business Plan Summit will be taking place on December 3rd in Portland. Issues of importance to all Oregonians will be discussed at this year’s summit. We’ll be paying close attention to how our policy makers address our fiscal crisis, with expenditures exceeding Oregon’s record tax revenues thanks to a booming economy. How will Oregon weather the next recession? At the same time, Oregon’s business community is focused on the roots of income inequality and those who have not benefited from this economic expansion. Tune in to hear from thought leaders from across the country on how we can, together, address our economic challenges and improve education and healthcare outcomes for Oregonians. Harvard economist Raj Chetty is set to keynote the December 3 Oregon Leadership Summit. Chetty and colleagues recently founded Opportunity Insights, a research and policy institute focused on using research and big data to revive flagging economic mobility at a state and local level. The institute, supported by major foundations, identifies factors that impinge on mobility and offers scalable policy solutions in collaboration with stakeholders on the ground. Chetty will be joined at the Summit by David A. Williams, Opportunity Insights policy director. In the breakout phase of the Summit they will explore with leaders from all sectors how to bring their work to Oregon. Reducing poverty is one of the three key goals and an active focus of the Oregon Business Plan. 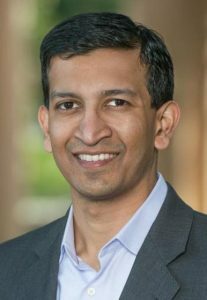 Chetty is a MacArthur “Genius” Fellowship recipient and 2013 winner of the John Bates Clark medal, awarded by the American Economic Association to the best American economist under age 40. His work on tax policy, unemployment insurance, and education has been widely cited in media outlets and Congressional testimony. His current research focuses on equality of opportunity and the challenge of giving children from disadvantaged backgrounds better chances of succeeding. Interested to hear what Chetty has to say? Follow us on Twitter and Facebook on December 3rd!